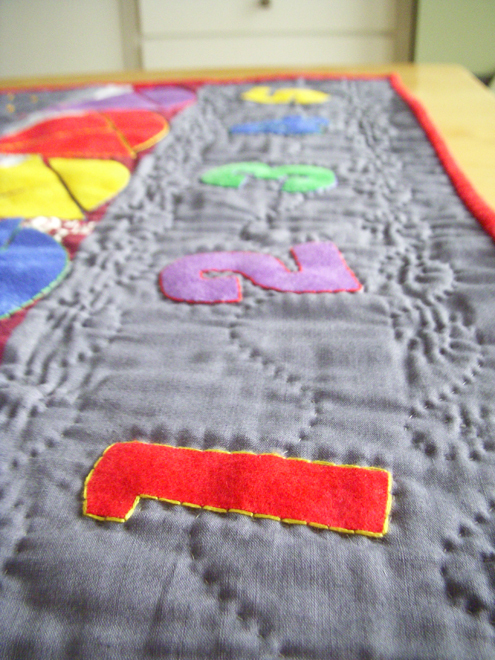 The story about the quilt in the banner. Up there at the top of this page. 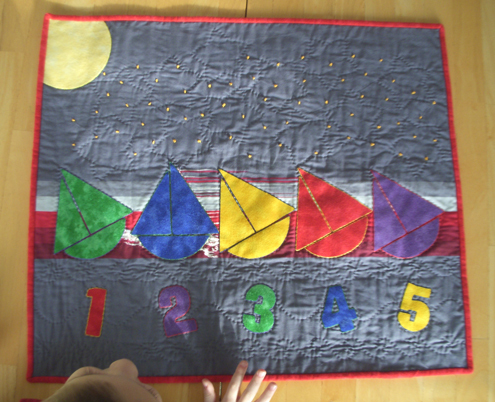 Yes, I'm talking about the sailboat quilt I'm featuring in my blog banner this month. What do you think of it? I really like a lot of things about it. Except for just one little thing. It's that fabric that makes up the background. Let's be nice and call it, um, challenging. Well, why the hooey did you use it then, Jenny? If you're asking, I'm telling. There's a story there. This is the panel the very kind leader of the humanitarian group brought to me. Sailboat? Yes. The group leader gave me a month to work with the panel. I tried to incorporate the sailboat image in a number of ways. 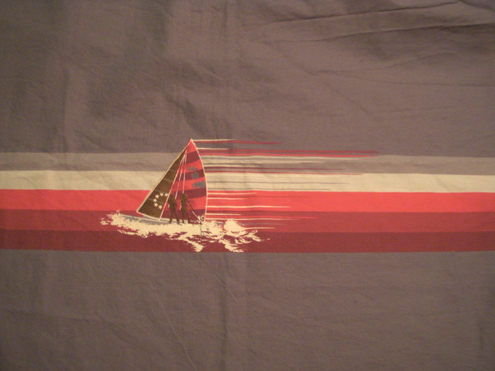 Eventually, my solution was to stick with the sailboat theme, but cover up the original sailboat completely. Try and happy it up as best I could. Sailboats, numbers, waves, stars, moon. Happier. Happier quilted stars, seen from the back of the quilt. I was a little nervous taking the finished quilt to the group leader. When I shyly mentioned that I wasn't sure the military sailboat was quite right for a schoolroom setting, she breathed a sigh of relief. "I hadn't realized those were soldiers on the sailboat!" she said. "We aren't supposed to send anything that has to do with war, or the military, or anything like that. I'm glad you noticed!" Then I breathed a sigh of relief. Because I (albeit unknowingly) chose the right path for the design, yes. But mostly because she has three more panels of the same fabric. I'm now nearing completion of sailboat wall quilt number two. Quilters make do. 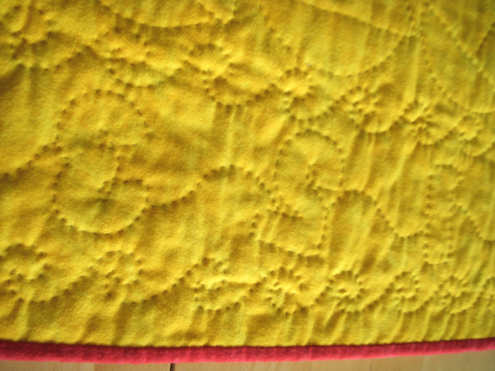 The quilt I came up with may not be heirloom quality, or something anyone would want to replicate. But it might help a child in a far-away country learn to count to five. Learn their colors. I made do, like quilters do. And I'm happier for it. I love your fix much better. 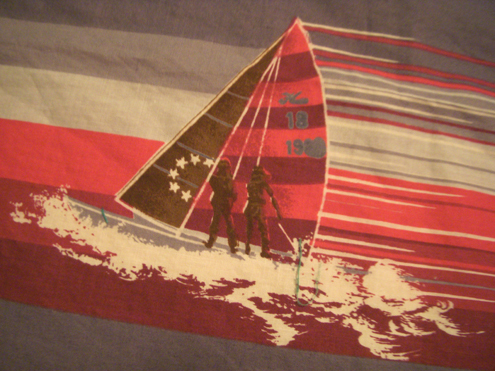 As for the military sail boat/ windsurfer thing that was odd I agree. 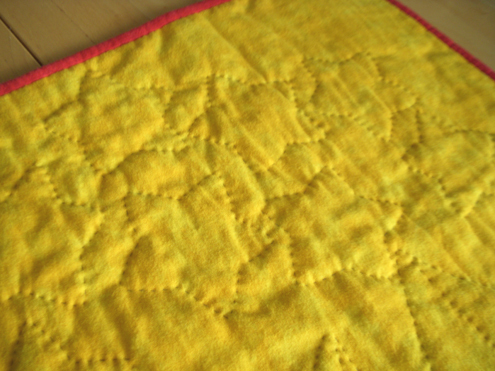 Are you making all three quilts the same or are you varying them? by the way cute baby. You need to teach me how to do what you do. I don’t even know how to turn a sewing machine on. I am CLUELESS!!!! Your work is so cute! That is a challenge! But you wouldn’t know it had all that underneath. Good job making do 🙂 It’s a great little quilt.